The Milam County A&M Club will be holding our Annual Aggie Muster on Monday April 22, 2019 at 44 Farms in Cameron. The Muster will begin promptly at 7:00p.m. ; starting with dinner, followed by the speaker and roll call for the absent. The meal will be provided by Milam County Aggie Moms Club. The speaker is R. Sam Torn, Texas Aggie class of 1970. Torn is the immediate Past Chair of the 12th Man Foundation, coordinated the redevelopment of Olsen Field at Blue Bell Park and is currently serving as chair of the university-wide Kyle Field Redevelopment Committee. He is the former Class Agent for the Class of �70, and President of the Association of Former Yell Leaders. All former students, parents of current students, and Class of 2023 newly accepted Aggies are encouraged to attend and participate in one of Texas A&M�s most cherished traditions. Tickets are $12.00 and can be purchased from Muster Chairwoman Mikaela Fuchs 254-718-2621, at Ideal Poultry in Cameron or contact Art Free 512-760-0510 in Rockdale for tickets as well. The Milam County Health Department is partnering with the Texas Department of State Health Services Public Health Region 7, Texas A&M University, School of Public Health, EPI Assist Team, and public health professionals from other Counties will conduct a County Health Assessment survey on April 26 � 27, 2019. The purpose of the County Health Assessment is to assess public health and develop a five year health strategy for Milam County to best utilize the Health Departments resources while improving public health needs. Across the county about two hundred and ten homes will be randomly selected to conduct the survey. Training will be conducted at Bea�s Kitchen to support the survey on the morning of April 26, 2019. In the afternoon between 3 � 5:30 pm groups will go out and begin taking surveys at residences. 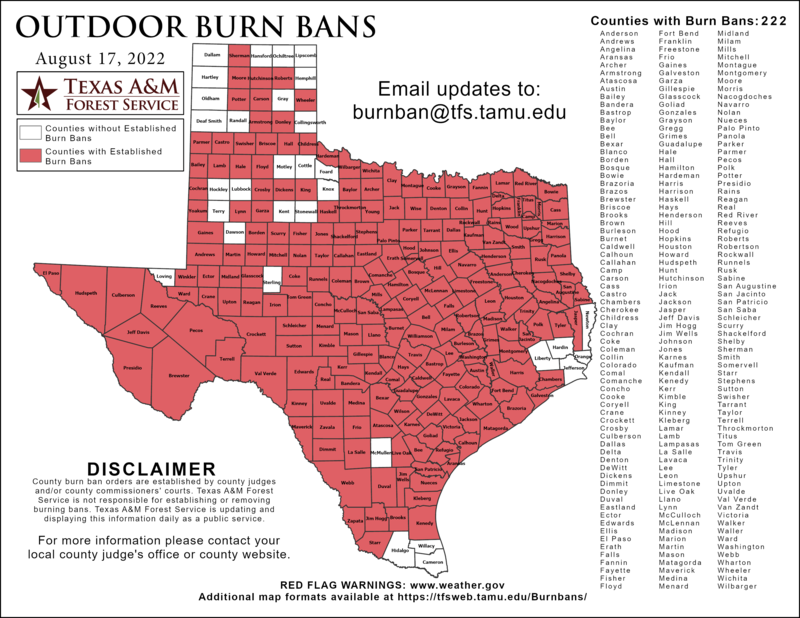 About 10 to 15 teams of 2 to 3 public health professionals and Texas A&M School of Public Health students will be conducting the survey. The health professionals will have vests which have �Public Health� on them and the A&M students will be wearing a maroon shirt which will have �EPI Assist�. On April 27, 2019 more surveys will be conducted around the county between the hours of 9am to 5pm. The survey should take between 15 to 20 minutes to complete. The Cameron Elementary School PTO presents a Spring Market from 9AM-3PM Saturday, April 27th, at the Cameron Elementary gym. Admission is FREE. There will be unique gifts, clothes, home decor, jewelry, and more. For info, email cameronelempto@gmail.com. Milam County Precinct 2 will be hosting a tire collection on Saturday, April 27th, from 8AM-2PM at the Precinct 2 barn at 3106 N. Travis in Cameron. Items accepted include Tires with rims, Tubes and tire pieces, and All Tractor Tires. Items NOT accepted include any industrial size tires or tires over the size of 17.5. If you have any questions call Commissioner Shuffield at 254-697-7054. The Cameron citywide cleanup will be Saturday, April 27th, from 8AM-3PM at the City Yard at 701 E. Main in Cameron. There will be free disposal for city residents. You must present your city water bill to take part. Acceptable items include: unbundled brush, furniture, yard waste, appliances without freon, and tires. Items NOT accepted include: paints and thinners, antifreeze, pesticides, herbicides, gasoline, automotive products, used motor oil and filters, freon items. All items should be separated by category to make the line move faster. If you have questions, call 697-6646. The Barclay community is holding its annual fundraiser April 28th at the Barclay Community Center. The delicious meal will consist of BBQ beef tri-tips, Greens BBQ�ed sausage, slaw, Westphalia noodles, beans and all the trimmings. There will be plenty seating for you to eat there or you can get plates to go. There will also be a silent auction. Serving starts at 11AM and goes until food runs out. Proceeds go to the community center to help with upkeep for this historic building. There will be a veterans appreciation luncheon Sunday, April 29th, from 12:30-3PM at the American Legion Hut at Ledbetter Park. For veterans, active duty military, and gold star families the meal will be at no cost to you. Speaker is Troy Kelley. There iwll be parking available for the disabled. No RSVP required. For more information, call 254-482-1902, 254-833-1531, or contact any american legion member. Registration Day for 3's and Pre-K will be May 1st and 2nd from 2-6PM in Room 101 at Ben Milam Elementary. This event is for those that pre-qualified with Mrs. Hanke for 3's, Pre-K, and Kindergarten. You will need to bring the following with you: child's birth certificate, child's immunization record, child's social security card, proof of address, and parent ID. The Lunch Bunch will meet on Thursday, May 2nd at noon at the First United Methodist Church Family Life Center in Cameron. Betty McDonald from the Cameron Thrift Store will do the program. The public is invited to attend. Bring a food dish to share for the lunch at noon. Everyone attending is also encouraged to bring something for the food pantry at the Thrift Store. St. Mary Catholic Church will host a Spring Bazaar on Saturday, May 4th, from 9AM-4PM at the Knights of Columbus Hall in Temple. The Hall is located at 2218 W. Ave. D. There will be hourly door prizes. Come shop the jewelry, clothes, unique gifts, home decor, canned goods, arts, crafts, and more. For info or vendor inquiries to baylorkidsfirst@gmail.com or call 254-654-1259. Cameron PD will be hosting a crawfish boil on May 4th, from noon until sold out at 605 W. 4th St. in Cameron. For $10 a plate you get your choice of a crawfish or shrimp plate with sides of potatoes and corn. Also on the menu is bootled water for $1 and hotdogs with chips for $2. For more information call 254-697-6574. St. Mary Catholic Church annual picnic will May 5th from 11AM-3PM at 1019 S. 7th in Temple. Outdoor Mass begins at 10AM, with the picnic to follow. Meals are $10 per plate from the Knights of Columbus. There will be live and silent auctions, raffles, music, games, and more. Raffle tickets must be purchased at the church and no tickets will be sold the day of. There will also be a dance with music from DJ Desperado from 7-11PM with a $5 cover charge. Cameron VFW presents the Can't Hardly Playboyz on May 11th from 8PM-Midnight. Doors open at 6:30PM. Tickets are $15 per person. The event is BYOB and the kitchen will be available. For info or reservations, call 254-295-6222. The 7th annual Milam County Aggie Moms Golf Tournament will be May 11th at Cameron Country Club. The 4-person scramble tourney will have shotgun start times of 9AM and 1PM. The tourney is open to all golfers and will be $75 per player. Singles are welcome. Lunch and carts will be provided. Prizes will be awarded. For info, call any Milam County Aggie Mom or Cameron Country Club. Sponsors are also being sought for the tourney. For sponsor or player info, call 512-760-5428 or 254-697-1373. Cameron VFW presents Billy Holt Band on May 18th from 8PM-Midnight. Doors open at 6:30PM. Tickets are $15 per person. The event is BYOB and the kitchen will be available. For info or reservations, call 254-295-6222. The City of Cameron will have a Community Work Day on Saturday, May 18th, from 8AM-Noon. Volunteers are needed! Show up at Bea's Kitchen with gloves, shovels, rakes, and friends. You will be assigned a project to do from there. A chili and cornbread lunch will be served to all volunteers at noon. The City of Cameron is hosting a Spring Clean from May 18th until June 18th. The City will post a roll-off dumpster at 5 locations across the City for citizens to use. Dumpsters will be at the southwest corner of West 12th Street Park, the Municipal Airport parking lot, next to the Williams Event Center, Cameron Business Park, and the south entry gate to Ledbetter Park. Items that can be dropped off include: bulk items, furniture, yard waste and tree limbs, and appliances without freon. Items NOT allowed include: paints and thinners, antifreeze, pesticides, herbicides, gasoline, automotive products, motor oil and filters, tires, and items containing freon. Powers Chapel Cemetery Day will be May 26th at 10AM. Work days are May 18th and 25th. Cameron VFW presents Rocky King Band on June 8th from 8PM-Midnight. Doors open at 6:30PM. Tickets are $20 per person. The event is BYOB and the kitchen will be available. For info or reservations, call 254-295-6222. Cameron VFW presents Mark Richey on June 15th from 8PM-Midnight. Doors open at 6:30PM. Tickets are $15 per person. The event is BYOB and the kitchen will be available. For info or reservations, call 254-295-6222. Cameron VFW presents Hector Alvarado and Samantha Rose on June 22nd from 8PM-Midnight. Doors open at 6:30PM. Tickets are $10 per person. The event is BYOB and the kitchen will be available. For info or reservations, call 254-295-6222. Cameron VFW presents Billy Mata on July 13th from 8PM-Midnight. Doors open at 6:30PM. Tickets are $15 per person. The event is BYOB and the kitchen will be available. For info or reservations, call 254-295-6222. Cameron VFW presents Landon Dodd on August 10th from 8PM-Midnight. Doors open at 6:30PM. Tickets are $15 per person. The event is BYOB and the kitchen will be available. For info or reservations, call 254-295-6222. The Temple VFW post 1820 is set to host a Veteran's Day Ceremony on November 9th, starting at 10AM, at the Moffat Cemetery. Cameron Police Department has now started the year round Explorer program. This program is a career oriented learning for life and geared to help encourage interest in all career paths. This program helps students learn the life of a law enforcement officer, life saving techniques, and developmental skills. This program is open to anyone ages 14-20, no arrest history, good moral character, positive references, and must be able to attend meetings and trainings. For more information or to apply stop by the Cameron Police Department at 605 W. 4th St. or call 254-697-6574. Background check may be required and parent permission is required. Rosebud Senior Center is open from 9AM to Noon, Monday-Friday. We have games (Bingo, Dominoes, Cards, etc.) each day. Box meals are served with a one-day notice. If you live in town and need transportation, please call us and we'll send someone to pick you up and return you to your home. Please call 254-583-4745 for more information. Camp Gladiator training with Rachel Kirk goes on every Monday, Wednesday, and Friday, at the Cameron Courthouse starting at 5AM. For more information Call 254-482-0385. The Milam Regional Farmers Market will be held the 2nd and 4th Saturdays in March through November from 9am to 1pm at The Yards of Cameron. There will be fresh produce, meat, eggs, bread and other baked goodies along with artisans, mushroom logs, crafts, woodworking and much more. Falls County Recycling will also be available to take recycled goods. For more information contact 254-697-4970. Karaoke will be held Friday at the Cameron VFW Post 2010. The Canteen will also be open to the public Tuesday through Saturday from 645PM until .... Dart tourneys will be held every Wednesday and Friday. Alsdo accepting donations for the Scholarship Fund. There will be washer tournaments benefitting the American Cancer Society on the 2nd and 4th Sunday of the month at Apache Pass in Rockdale. On the 2nd Sunday, bring your partner. On the 4th Sunday, draw for a partner. Tossing starts at 5:15PM with registration at 4:30PM. Cost is $20 per team, double elimination. For info, call 512-760-7194. Join the Cameron Library for Books to Grow On Story Time, Wednesdays at 10:30AM. The Cameron Volunteer Fire Department is now accepting applications for membership in the department. No prior fire service qualifications are needed. Applicants must be 18 years of age, no criminal history, have a drivers license, a vehicle to respond with, live within a few miles of Cameron, and most of all be able to repond to fires and attend meetings and drills each Monday. For more info, contact any firefighter or stop by the fire station, or call 697-4702. The Yoemen Band Booster Club meets every 2nd Monday at 6PM in the Yoe High Band Hall which is next to the Performing Arts Center (PAC). The public is welcome. Memberships are also available for $10 per person. Upcoming meetings are Oct 10th, Nov 7th, Dec 12th, Jan 9th, Feb 13th, Mar 6th, Apr 10th, and May 8th. Monthly Meetings of San Andres Masonic Lodge #170 AF&AM in Cameron, located at 106 West 6th Street, will meet the 2nd Thursday of each month. A meal is at 6:30PM, with the meeting to follow. Defensive Driving/Ticket Dismissal classes are available the 2nd Saturday of every month in Milano from 8:30AM-3PM. For class dates, Text or call: 254-760-6110, or send an e-mail to: HarrisEdSvc@yahoo.com for more informatio. Pre-register is required. You can save up to 10% on your vehicle insurance by taking a class! Every Thursday and 3rd saturday, Jimmie Maze and the Milano Playboys perform at Chriesman Community Center, from 7-9PM. Milano Jamboree will be held the last Saturday of every month at 7PM in the Milano Senior Citizens Center. Blessings from GOD food Pantry will distribute food to citizens on the first and third tuesday of each month. The first Tuesday, hours are 6 p.m. to 8 p.m. and the third Tuesday, 8 a.m. to 10 a.m.
Enrollment for GED classes is getting underway. Classes will be held Tuesday and Thursday from 6-8PM. ESL classes will also be held. ESL classes will be Tuesday and Thursday from 4-6PM. Cost of the classes is free. If you would like to enroll or would like more info, contact Karen at 593-3011 or 593-2744. Are you 55 years or older & in search of a job in the Cameron area? Put Experience Works to work helping you. We are a National non-profit organization that provides training and job placement services for older workers. We provide paid work experience through collaboration with community service agencies in the your area. Put your experience to work today by calling 1-800-460-8801 ext. 2003 TODAY! Standards of Care will be at Bea's Kitchen, at 101 East Main Street, at 10:30am on the 1st and 3rd Tuesdays of each month for free blood sugar and blood pressure checks. Crafting Galore will meet the 2nd and 4th Monday of each month, from 12:30-4PM roughly at the First United Methodist Church Family Life Center located at 111 N Travis in Cameron. This is a community group for all Handcrafters. If you're working on a project, competed 1 and want to share it, or just looking for ideas or instruction, this is the group for you. Use the side door and bring a small snack to share. Coffee and tea are available.